These past few years, I have become a lot more sedentary than I should be, and I'm pretty sure that's not a good thing for my health. 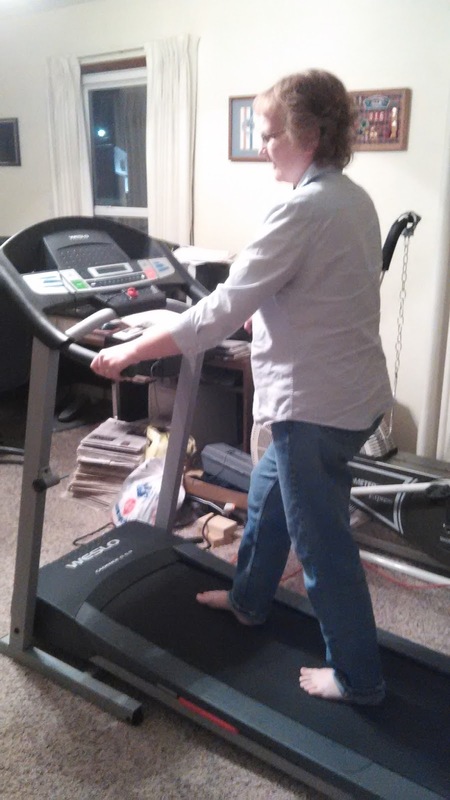 So, with determination to become more active, I decided to get a treadmill and start walking more consistently. After being unable to find a good, used treadmill (yes, used, because it makes sense to be frugal whenever possible), I spoke with David about ordering a new one, and he agreed. So, I bought it online from Walmart and was really looking forward to getting it. Then, the frustration began. 1. I bought the treadmill online on Sunday, September 10th, and it was shipped to the house for free, arriving a week later on Monday the 18th. My thoughts after ordering: Yay! I'm so excited for it to get here! Thank you, God, for providing the funds for us to get this. This is something I have been wanting, and needing, for a long time! 2. David started putting the treadmill together on Tuesday evening (the 19th), and discovered two connectors would not fit together. Disappointment literally overwhelmed me and I went to bed early that night feeling sad and glum. My thoughts: This is something I had my heart set on, God. It is a big disappointment to have to wait even longer for it. Why did this have to happen? Isn't it a wise decision to become healthier, so I can continue caring for the family You have given me? 3. After several phone calls and e-mails to the company that week, they finally put in an order for the right part to be sent to us. It was sent out on September 25th and took almost another week to get here, finally arriving on Saturday, September 30th. I tried to get them to put a "rush" on the shipment, but they wouldn't do that, so I just had to have patience. My thoughts: I thought I already had enough patience. Caring for my special needs daughter, homeschooling my son who doesn't enjoy school, and adjusting to my husbands inconvenient work situations for so many years - I don't think I need anymore patience! This isn't fair, God! 4. We were busy on the Saturday the parts arrived, so David wasn't able to put the new connectors on until Sunday, October 1st. In order to install the new part, he needed to remove the cover to the motor and, when he did, we noticed the motor was also broken. My thoughts: You have GOT to be kidding me! Really, Lord? I don't ask for much. I try to be content with what I have (or don't have) and I have never been demanding about material things. So, I just don't get it. Why is this happening? What did I do wrong to receive this kind of treatment? I admit, I was feeling somewhat hurt by God for not giving me this long-awaited desire. 5. David called the company back again on Monday, October 2nd. They said they would ship us a new motor. Then, in a few days, someone would be giving us a call to set up a time for a technician to come out and install the new motor, as well as the new connectors. 6. I received a call that a technician would be out on Friday, October 13th. In the meantime, the motor showed up on Monday, October 9th. My thoughts: Well, good, at least we have a technician on the way. As long as nothing else goes wrong, it should be working by Friday. 7. On Friday, October 13th, the technician arrived at 8:30 in the morning and immediately got to work. The treadmill was finally working within an hour. My thoughts: Phew! It has been more than a month since I first ordered it, and I'm finally able to use it! I don't understand why all this happened, but thank you, Lord, for getting it working and for helping me through the frustration. God doesn't always give us what we want, or give us something WHEN we want it. Regardless, He is a good God, and I will still love Him. We can be honest with God about our feelings. He cares about us, wants to hear from us, and wants to help us through the difficult days. We can remain faithful in our Christian walk, believing there is a reason for what we are going through, even if we don't understand it.